A still from the grass seed animation. The gauze and the grass seeds. The beginning of the work for Bathurst Regional Art Gallery. 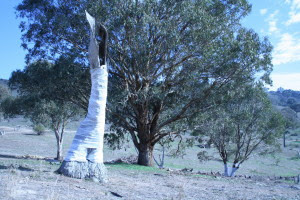 I’m working on my exhibition “Gathering’ at Bathurst Regional Art Galley, 17 August to 30 September, 2007 and need some help in gathering materials. I’m after old gauze. Can you help? It’s time to clear out that old medicine kit and send me the gauze wadding and bandages that have been sitting in the bottom of the kit for 20 years stained by time or betadine. Gauze that would be of no use to you. Your donation to the gauze works will be documented and added to this blog. The gauze I have received so far drawn attention to some interesting things in the first aid kits, a bottle of cod liver oil, the ‘cure all’ was in a school's kit. One first aid kit was used by a school football teams in the early 1970s and had a packet of asprin possibly 40 years old nestled within it. If you send you gauze by mail I will photograph the package and the contents. You can also add a story and a photo if you wish. Some of the gauze that you send me will be incorporated in the disk work ‘gauze and grass’ in the "Gathering' at Bathurst Regional Art Gallery. Other pieces will be kept for works in the future. I aim to place the disk of gauze and seeds on the floor, in the gallery. The size of this work will depend on how much gauze I get sent. Now it is about 32cm diameter with 2 rolls of gauze. I like the patina the old gauze has collected over time and the waves which have been set into the gauze from the pressure in the centre of the roll. I am looking at the grasses that grow just down the road, the roadside vegetation, there are at least 10 different varieties and after the rain they are busily growing and producing seed. Such a precious image after the years of dust and heat. I am collecting the seed and making work from the seed and gauze. 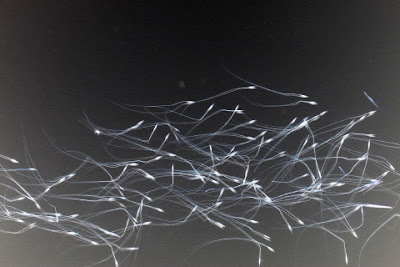 The seeds move as the humidity changes and their awn (thin long tail like structure or ‘bristle-like projection’) bends and kinks and straightens with moisture. This works links into Symmetrical Planting, the installation from New England Regional Art Museum. Your gathered materials will be documented on arrival and with your contribution of gauze you become part of the ‘Gathering of the Gauze’ project. Please send the link to anyone that you think would be interested in the project. me in a first aid chest clean out and update.